The road to the left of the Stone House leads you to Tamarack. Along this road many objects can be found to use with the Mandala activity. Symmetry in Nature materials will be collected as we explore Black Rock Forest (Leaves, sticks, rocks, flowers, pine cones, pine needles…), Power Point, computer, rulers, geo-boards, rubber bands, pattern blocks, reflection mirrors, sun paper, clay, animal skins, skulls, turtles, tree cookies, preserved insects, birds nest, fossil rocks, feathers. The students will write their LEARNING GOAL at the top of the page: Sort polygons according to the number of lines of symmetry and the order of rotational symmetry. Next, they will write about what they already know about polygons and symmetry. After the chart, above in link,is added to their math journals, they will write “what I learned”, here they will reflect on the activity and write out their conclusion. The students will distinguish between lines of symmetry and rotational symmetry by creating a T-chart for comparison. Students will use their notebooks to create this activity. Guided Math Centers—During guided math the following activities will be worked on to reinforce the above lesson. 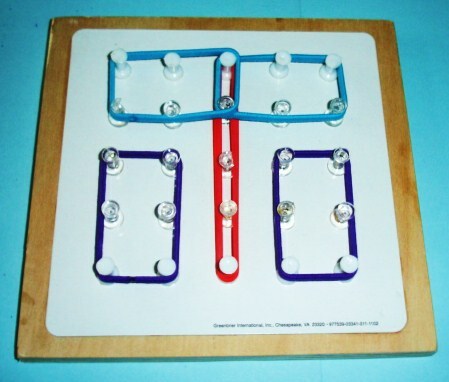 *Geo-boards- A geoboard is a mathematical manipulative used to explore basic concepts in plane geometry such as perimeter, area and the characteristics of triangles and other polygons. At the center students will create polygons and show symmetry by using rubber bands to create symmetry line divisions. *Pattern Blocks- At this center the students will identify the shapes of the pattern blocks. They discuss characteristics of each Pattern-Block shape and sort them into groups according to common attributes. They will then discuss defining and non-defining attributes of the shapes. Once sorted the students will trace one pattern block from each group and determine if it has a line of symmetry and if it has rotational symmetry. *Pattern Block Symmetry Designs- At this center the students will create designs using pattern blocks to show symmetry. The will use a 12-inch ruler to divide their design in half and then create. *Circles with Quadrants- At this center the students will use circles that have been divided into quadrants (fractional parts). Depending on the difficulty level you can choose from 2,4,6, or 8 sections for the students to create symmetrical designs. A variety of manipulatives can be used for example: plastic bears, rubber insects, snap cubes, pattern blocks…. Below is an example of a two, four and eight quadrant symmetrical designs using pattern blocks. At this location, the students will go on a SYMMETRY IN NATURE SCAVENGER HUNT. The students will be asked to find objects that have symmetrical qualities and to keep in mind that they will need even numbers of this object to create their Nature Circles. The Students will be informed of the relationship to the pre-forest activity Circles with Quadrants. Students will use clay to form their Nature Circles and then use their Symmetry in Nature Scavenger Hunt items to create their Mandalas’ symmetrical design. This activity will begin by listening to one of the following books about symmetry. **If there is ample time the students will play the Mirror Game were the students will use body movements to create symmetry. Here the students will make eye contact with their partners and one partner will lead the other on a symmetrical cat and mouse chase that involves movement, coordination, and concentration skills. As one person moves the other must move simultaneously which in turn will create symmetrical movements between partners. Two activities will take place upon return to the forest. First, the students will create symmetry portraits. 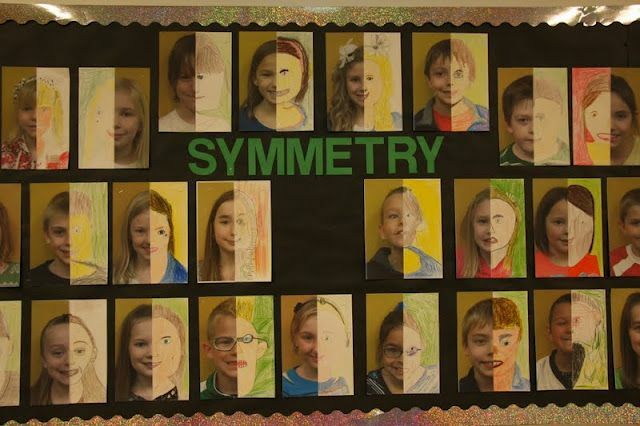 Symmetry portraits consist of a photograph of the student cut in half and glued onto a white piece of paper. The students will finish the other side of the portrait by using their newly gained understanding of symmetry and how it works. The finished product will consist of half of a photograph face and a student drawn half of a face creating a symmetrical work of art. Second activity is listed under assessment below. All of the points on the left side are the same as the right side. All except 1 of the points on the left side are the same as the right side. All except 2 of the points on the left side are the same as the right side. 3 or more of the points on the left side are not the same as the right side. All of the lines were drawn in the correct order. All except 1 of the lines were drawn in the correct order. All except 2 of the lines were drawn in the correct order. 3 or more of the lines were not drawn in the correct order. The Butterfly is exceptionally attractive in terms of neatness and design. The Butterfly is attractive in terms of neatness and design. The Butterfly is acceptably attractive in terms of neatness and design though it may be a bit messy. The Butterfly is messy in terms of neatness and design. It is not attractive. The color and/or design added to the butterfly is similar on the left and right sides but not exactly the same. The color and/or design added to the butterfly is not the same on the left and right sides. There was no use of color added to the butterfly. 4.G.3 : Recognize a line of symmetry for a two-dimensional figure as a line across the figure such that the figure can be folded along the line into matching parts. Identify line-symmetric figures and draw lines of symmetry. Students will be able to identify symmetrical figures, draw/ recognize lines of symmetry for given two dimensional figures, and explain why or why not a figure has symmetry. What is the definition of Symmetry? Symmetry is a transformation that leaves that object unchanged. Symmetry comes from a Greek word meaning 'to measure together' and is widely used in the study of geometry. Mathematically, symmetry means that one shape becomes exactly like another when you move it in some way: turn, flip or slide. For two objects to be symmetrical, they must be the same size and shape, with one object having a different orientation from the first. There can also be symmetry in one object, such as a face. If you draw a line of symmetry down the center of your face, you can see that the left side is a mirror image of the right side. Not all objects have symmetry; if an object is not symmetrical, it is called asymmetric. There are three basic types of symmetry: rotational symmetry, reflection symmetry, and point symmetry. *a line that divides a 2-D shape into halves that match when the shape is folded along the line of symmetry. This is a trapezoid it has one line of symmetry. This square is a regular polygon. 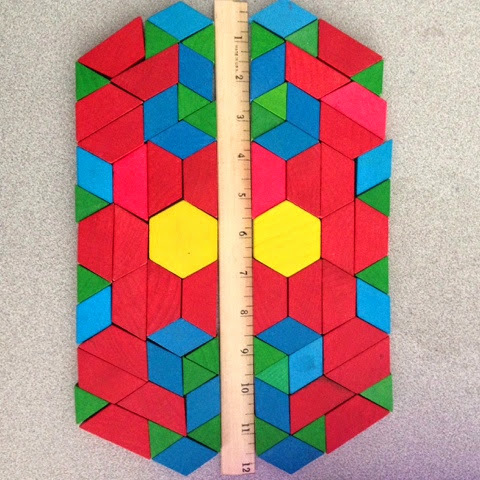 It has 4 equal sides, and 4 lines of symmetry. This parallelogram has zero lines of symmetry. *a shape that can fit on itself exactly more than once in complete rotation has rotational symmetry. This shape does not have rotational symmetry. This shape does have rotational symmetry (order of 2).